Home > Branding > Creepy. Distasteful. But not at all surprising. The Blue Ivy Trademark. Creepy. Distasteful. But not at all surprising. 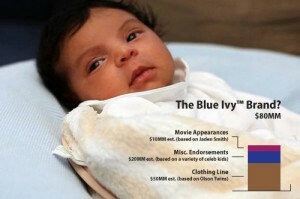 The Blue Ivy Trademark. As a parent, it’s tempting to read the story of Jay-Z and Beyonce “trademarking” their child and wish we could turn back time and convince them both to use birth control. However, when we put aside some initial discomfort, we can see that the trademark makes business sense. Because what is the point of a trademark? To protect something of value. As the spawn of nearly a billion dollars of marketing muscle, protecting the Blue Ivy™ brand is a wise investment. Why else might the two pop icons want to protect their little girl? Read up on the legal angle. Visit Interbrand for more information and case studies on brand valuation. More than you ever needed or wanted to know about Jay-Z and Beyonce on Wikipedia.